Saico Healthcare Pvt. Ltd. is a trusted name among the foremost Stevia and Natural Stevia Sweetener exporters and suppliers from Delhi. 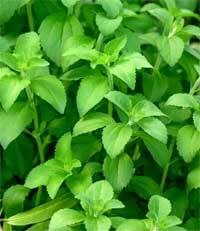 Natural Stevia is a zero calorie sweetener manufactured from leaves of this plant, which are dried. The Natural Stevia, offered by us, offer 20 to 25 times sweeter than cane sugar. Leaves contain seven different di terpene glycosides of which the most important are stevioside and rebaudioside. Di terpene glycosides skip insulin pathway and end up as calorie free sweeteners. Steviosides are stable at 180 degree C, with many applications in the food and beverage industry these leaves have created huge demand for themselves in the market. Natural Stevia leaf extracts can be used to sweeten beverages like coffee, tea, fruits juice, food products like baked products, chocolates, Indian sweet delicacies etc. Natural Stevia leaves are also known for their excellent skin tightening properties, in addition to their use as anti-oral bacterial, reduction in hypertension, digestive properties and cardio tonic properties.